Where does Kareem Hunt fit in the Kansas City backfield? We look at his dynasty future. Editor’s Note: As our coverage of the 2017 NFL Draft and its impact on fantasy football continues, we bring you our 2017 Rookie SWOT series. These articles will feature video highlights, combine reviews, strengths, weaknesses, opportunities, threats, short-term expectations, long-term expectations and rookie draft advice for over 30 of the best dynasty league prospects from this year’s draft. We’ll mix them in with team-by-team draft reviews because, you know, that’s kind of what we live for. 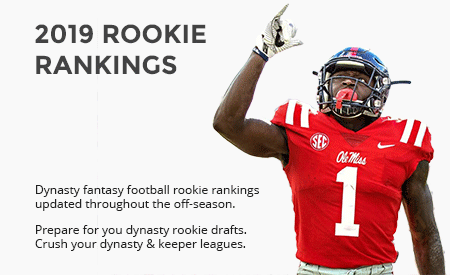 Make sure you’re ready for your dynasty league rookie draft by staying up on all these articles, checking out our rookie draft guide, rookie rankings, rookie draft cheat sheet and post-draft mocks. There are simply no better resources out there for dynasty fantasy football enthusiasts. A video game dealer by day, fantasy author by night, and super handsome guy all the time, Jeff is here to answer the questions nobody asked. Also: dated pop culture references and the misuse of uncommon words. Be sure to also check out Jeff's eBay video game store! Hunt and Ross are rated about the same and in my rookie draft, it was either Hunt or Ross and Kamara. There’s a lot to like about Hunts floor, but Ross being taken as a top 10 pick was enough to make me comfortable taking Ross. I think a lot of times, people let situation override where some players actually went in the NFL Draft, particularly when he’s considered a “draft darling.” Don’t get me wrong, I love Hunt as a prospect and he landed in a great spot. That gives him 1st round consideration in dynasty rookie drafts. Since 2012, excluding the extreme cases in top 10 WRs, you cut out guys like Justin Blackmon and Mike Evans and his predictability is somewhere between Amari Cooper, Sammy Watkins, Tavon Austin and Kevin White. In the same period for 3rd round RBs, cut out the extreme samples like David Johnson and Tre Mason and you get somewhere between Terrance West, Bernard Pierce Jerrick McKinnon, Knile Davis, and Tevin Coleman. Say what you will about Tavon Austin and Kevin White, but Tavon has been productive as most those RBs, Kevin White still has serious upside we’re not yet able to gauge, and Cooper and Watkins are pretty darn productive injuries aside (some of those RBs listed – Tevin in particular – also have injury concerns). All this is to say – draft position matters and it has to matter even more when we’re talking about 80 picks between the two guys being considered.